Les Poires, as sold separately to cover the expenses of a trial of Le Charivari, after a version published in Le Charivari of January 17, 1834. The drawing was made by Honoré Daumier after the sketch of Philipon. 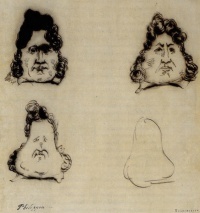 The courtroom drawings as they were published in La Caricature of November 24, 1831, 10 days after the trial. "Les Poires" (1831-34, English: The Pears) is a famous caricature by Charles Philipon. It lampoons the French king Louis Philippe I, who ruled France from 1830 until 1848. The story of The Pears begins in a Parisian courtroom when Philipon is on trial for publishing Le Replâtrage, a caricature of Louis-Philippe. Published in La Caricature of June 30, 1831, it symbolically represented the king as a mason erasing the traces of the July Revolution. Philipon was charged with lèse-majesté. He defended himself by claiming that in Le Replâtrage, the king’s image was an abstract representation of the government and not a direct attack on Louis-Philippe, even if there was a passing resemblance with the king. On the November 14, 1831 hearing during the trial, facing the judges, Philipon demonstrated in a clever argument that "tout peut ressembler au roi" ("anything can resemble the king"), and that he could not be held responsible for the resemblance in Le Replâtrage. He illustrated his defense by metamorphosizing the king's portrait in a pear. The set of four drawings begins with an accurate portrait of king Louis-Philippe and gradually transforms into a pear. This set would become the symbol of the overweight king. The courtroom drawings, also known as the 'croquades faites à l'audience du 14 novembre 1831' (illustration: right) were subsequently published in La Caricature of January 26, 1832. A third notable "pear" caricature is one consisting entirely of text typeset in the form of a pear, the so-called "Typographic pear" which was published on the cover of Le Charivari of February 27, 1834, subverting the magazine's obligation to publish the condemnation by presenting the text in the form of a pear. The pear (in French, poire means pear and fool) would become an icon for the overweight king Louis-Philippe. Heinrich Heine wrote in Französische Zustände (1832; “French Affairs”) that Paris was decorated with "hundreds of caricatures" and that La Poire had become "the permanent standing joke of the people." The English writer William Makepeace Thackeray would write in The Paris Sketch Book that everyone who visited Paris in the 1830s would remember "the famous ‘poire’ which was chalked upon all the walls of the city and which bore so ludicrous a resemblance to Louis-Philippe." Vendues pour payer les 6,000 fr. d'amende du journal le Charivari. Sur la demande d'un grand nombre d'abonnés des départemens, nous donnons aujourd'hui dans le Charivari les poires qui serviront à notre défense, dans l'affaire où la Caricature fut condamnée à six mois de prison et 2,000 fr. d'amende. Ce croquis ressemble à Louis-Philippe. Vous condamnerez donc? Alors il faudra condamner celui-ci, qui ressemble au premier. Et enfin, si vous êtes conséquens, vous ne sauriez absoudre cette poire, qui ressemble aux croquis précédens. Ainsi, pour une poire, pour une brioche, et pour toutes les têtes grotesques dans lesquelles le hasard ou la malice aura placé cette triste ressemblance, vous pourrez infliger à l'auteur cinq ans de prison et cinq mille francs d'amende!! Avouez, Messieurs, que c'est là une singulière liberté de la presse!! Made in the Paris Court of Assizes by the Director of LA CARICATURE. Sold to pay the 6000 francs fine of the newspaper Le Charivari. 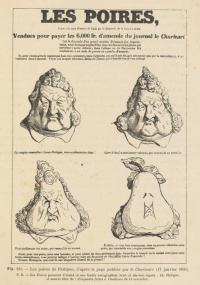 At the request of a large number of subscribers, we present today in Le Charivari, the pears which served as our defense in the case where La Caricature was sentenced to six months’ imprisonment and a 2,000 francs fine. If, to recognize the monarch in a cartoon, you do not expect it to have a resemblance, you will fall into the absurd [?]. Look at these shapeless sketches, to which I limited my defense. [Beneath the 1st drawing] This sketch looks like a Louis-Philippe, do you condemn it? [Beneath the 2nd drawing] Then we must condemn this one, which resembles the first. [Beneath the 3rd drawing] Then condemn another, which resembles the second. [Beneath the 4th drawing] And finally, if you are consistent, you can not absolve this pear, which resembles the preceding sketch. Thus, a pear, a bun, and all the grotesque heads in which chance has maliciously placed this sad resemblance, you can inflict on the author five years imprisonment and a fine of five thousand francs!! Admit it, gentlemen, this is a peculiar freedom of the press!! Unless indicated otherwise, the text in this article is either based on Wikipedia article "The Pears" or another language Wikipedia page thereof used under the terms of the GNU Free Documentation License; or on original research by Jahsonic and friends. See Art and Popular Culture's copyright notice. This page was last modified 07:55, 15 February 2015. This page has been accessed 18,814 times.